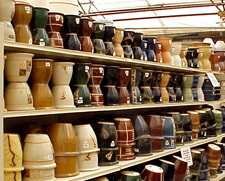 We import containers of pots directly from China with thousands of pots and saucers in each one. Since we import directly, we have a fantastic assortment of styles that are unique for us. 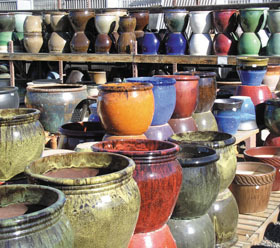 The value of these pots is exceptional, since we are importing them directly. They work well both indoors or outside on the patio. We carry a wide selection of saucers to match a pot you may already own. 100% watertight pottery. Stunning colors that complement houseplants. Just set your plain pot that contains the plant inside. 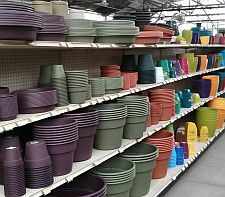 Colorful plastic pots for your houseplants from Bloem. 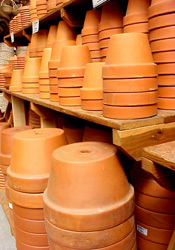 Some look like clay but are weatherproof and much cheaper especially in larger pots. Their extensive selection of colors allows us to match any decor. 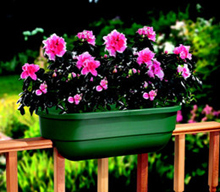 Designed to fit on 4" or 6" wide deck rails. 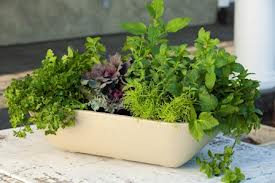 Patio Pods are generous-sized self-watering planters for flowers, herbs, small vegetables or fairy garden fantasies. It has a deep water-minder reservoir which provides for less time watering. 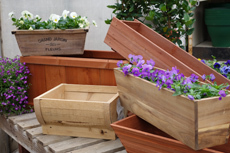 Redwood planters and tubs from the Northwest round out our selection. These are still favorites of many of our customers who like the natural warmth of wood.